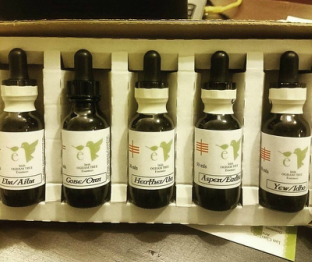 Celtic Tree Essence consultation for health and inner growth. thirteen consonant trees that form the lunar months from the Ogham calendar. To briefly explain, each of us has an underlying constitution that gets out of balance when we stress or over-tire ourselves. The five vowel essences address that problem. Fortunately we normally need only one particular Celtic Tree essence in this range. Indeed, I am a great believer that nature has the remedies we need, and our trees provide great support to our emotional, physical and spiritual centres. I am a qualified Ogham tree practitioner, which means I can administer a Celtic Tree essence created from the Celtic trees. The “Ogham” trees belong to part of a long tradition in Western Europe that was particularly strong in Ireland and Scotland. The tradition underwent a revival in recent decades since there is a rising interest in the multi-dimensionality of the natural world. To support your process while taking Ogham tree essences my guided tree meditations help you further embody the qualities of the trees, seeing how they are fit within your psyche. Moreover my booklet Tree Murmurs educates through my tree poems and tree calendar. The book dovetails well with the Celtic Tree essence system. The Constitutional Essences re-establishes yourself with your unique character. YOU are vibrationally linked to all of the five characters or constitutional traits of the trees. However, there is usually a weakness in one moreso than all the rest.